The Colubridae (from Latin coluber, snake) are a family of snakes. With 304 genera and 1,938 species, they are the largest snake family, and include about two-thirds of all known living snake species. The earliest species of the family date back to the Oligocene epoch. Colubrid species are found on every continent except Antarctica. 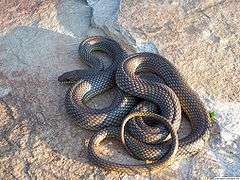 While most colubrids are not venomous (or have venom that is not known to be harmful to humans) and are mostly harmless, a few groups, such as genus Boiga, can produce medically significant bites, while the boomslang, the twig snakes, and the Asian genus Rhabdophis have caused human fatalities. Colubridae also include the few species of actually poisonous snakes, notably Rhabdophis tigrinus, the Japanese grass snake or yamakagashi, the difference between poisonous and venomous being that venom requires direct administration (i.e. intravenous injection) and poison can be administered indirectly (i.e. skin contact or ingestion). The Colubridae as traditionally defined are not a natural group, as many are more closely related to other groups, such as elapids, than to each other. This family has classically been a "garbage bin taxon" for snakes that do not fit elsewhere. Additional research will be necessary to sort out the relations within this group. 1 2 3 Bauer, Aaron M. (1998). Cogger, H.G. ; Zweifel, R.G., eds. Encyclopedia of Reptiles and Amphibians. San Diego: Academic Press. pp. 188–195. ISBN 0-12-178560-2. 1 2 3 Bruna Azara, C. (1995). "Animales venenosos. Vertebrados terrestres venenosos peligrosos para el ser humano en España" (PDF). Boletín de la S.E.A. 11: 32–40. ↑ Scott A Weinstein; David A. Warrell; Julian White; Daniel E Keyler (20 June 2011). “Venomous Bites from Non-Venomous Snakes: A Critical Analysis of Risk and Management of “Colubrid Snake Bites. Elsevier. p. 1. ISBN 978-0-12-387755-0. ↑ Fry, B.G. ; Vidal, N.; van der Weerd, L.; Kochva, E.; Renjifo, C. (2009). "Evolution and diversification of the Toxicofera reptile venom system". Journal of Proteomics. 72: 127–136. doi:10.1016/j.jprot.2009.01.009. PMID 19457354. Wikimedia Commons has media related to Colubridae. Colubridae at the Reptarium.cz Reptile Database. Accessed 23 January 2009.